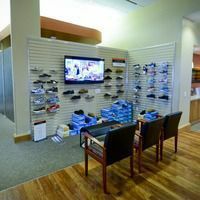 Sports Injuries and Athletic Foot Care | Podiatry Associates, P.C. Because our heels absorb so much impact, there are many injuries that are common among athletes. Plantar fasciitis—when the tissue connecting your toes to your heel (plantar fascia) becomes inflamed, this causes a radiating pain beneath the heel, typically worse after it’s been at rest. Bruised Heel—Again pain is located under the heel, but it does not radiate into the rest of the foot and actually improves with rest. Heel Spur— pain stems from a growth underneath the heel where the plantar fascia attaches to it. Sometimes pain is not present. Achilles bursitis—resulting from an inflamed bursa between the Achilles tendon and heel bone, pain is located in the back of the heel, which may feel spongy when you press on it. Sever’s disease—typically seen in young athletes from 8 to 15 years of age, pain is concentrated where the Achilles tendon meets the heel bone. Achilles tendinitis—Inflammation, pain, and a thickening of the Achilles tendon are hallmarks of this condition, which covers a number of Achilles issues. Broken toe—a fracture to any of the bones of the toe is usually a result of sudden trauma or impact. There will be obvious pain, swelling, and discoloring. A more gradual pain over time indicates a stress fracture. Ingrown toenails—improper footwear or trimming your nails incorrectly can lead to redness, pain, and possible infection. Black toenails—also known as subungual hematoma, this is often caused by repetitive trauma, like toes bumping against your shoes when you run downhill. It can also result from direct impact to the toe, like something heavy falling on it. Turf toe—this is a sprain to the ligament at the joint of the big toe, often caused by shoes gripping a surface, like turf, while your body shifts forward, bending the toe too far. Metatarsal fracture—breaks of one of the long bones (metatarsals) between the ankle and the toes. Athletes will not be able to put weight on it. Extensor tendonitis—with this overuse injury, the pain is felt on the top of the foot and is accentuated by lifting the foot and toes. Navicular stress fracture—a crack in the bone signified by a gradual build-up of pain in the midfoot, and associated with overuse. Morton’s neuroma—pain typically between the third and fourth toes associated with the nerve. Metatarsalgia—pain and inflammation in the ball of the foot associated with metatarsal bones. Hallux rigidus—pain and stiffness of the big toe joint, accompanied by inflammation. Sesamoiditis—this affects the sesamoid bones, mainly at the base of the big toe. Bunions—This painful deformity of the big toe joint that is often irritated by shoes that are too tight. Athlete’s foot—symptoms include itchy, flaky skin and a burning sensation, often between the toes. It is caused by fungus and can develop when you wear shoes that don’t breathe and go barefoot in public places like locker rooms and showers. Blisters—this common condition for athletes is caused by repetitive friction between the skin and shoe. Corns and Calluses— these are patches of thick, hard skin, mostly found at pressure points on the foot. If you have been hurt participating in a physical activity, or you’d like more information on any of these common sports injuries, call Dr. Cynthia Oberholtzer-Classen and the team at (303) 805-5156. Podiatry Associates, P.C. offers locations in Castle Pines, Cherry Creek, and Parker, CO. Visit our winning team today!